Celebrating the New Year can be quite difficult with staying up till midnight – some of us find that staying up that late is impossible and with kids – not fun the next day. So we thought that maybe your Tinselbox items could be used to wish a New Year during the day. Why not ring an international New Year? We are picking three different international locations to use as a daytime internationally inspired New Years Party (Russia, United Kingdom and France). So, when it is 4PM in New York, Russians in Moscow are toasting and kissing for the beginning of their new year. And we figured, why not do the same – and throw a party that counts down to the New Year as if we are in Moscow? New Year’s Day is a family holiday for many Russians. Traditionally, New Year’s Day in Russia fell on September 1, which ended Russia’s tax year. In 1700, in an attempt to westernize the country, Russian ruler Peter I moved the holiday to January 1 according to the Julian calendar. Russia started using the Gregorian calendar in 1918. Celebrations start with dinner, usually starting late on December 31st. Traditional meals include Russian salad, herring and sparkling wine – with glasses raised to toast during the chiming of the Kremlin clock. Some people go out to make a snowman or light firecrackers in their backyards. 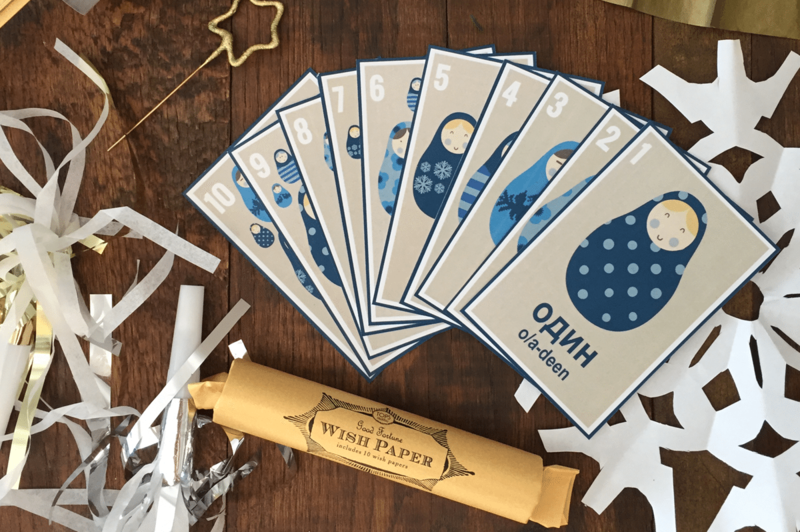 Celebrations for children include a decorated fir tree and Grandfather Frost, the Russian equivalent of Santa Claus, who gives presents. Grandfather Frost often comes with his granddaughter, Snegurochka (“The Snow Girl”). As things quiet down later in the day, many people visit their friends or relatives. Another tradition is to wish a “Happy New Year” to passers-by throughout January 1. 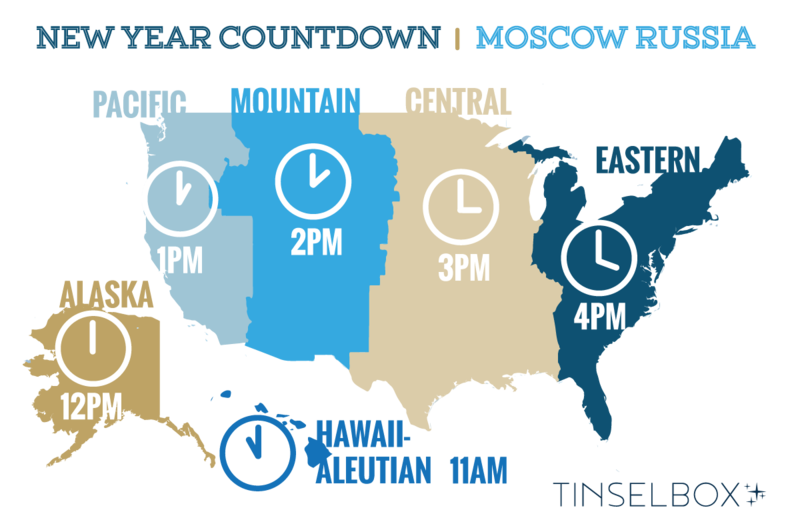 So, for a Russian themed countdown during the year we have created this map to help you know when it is time to do the countdown. The map shows the time that it would be when Moscow strikes midnight. 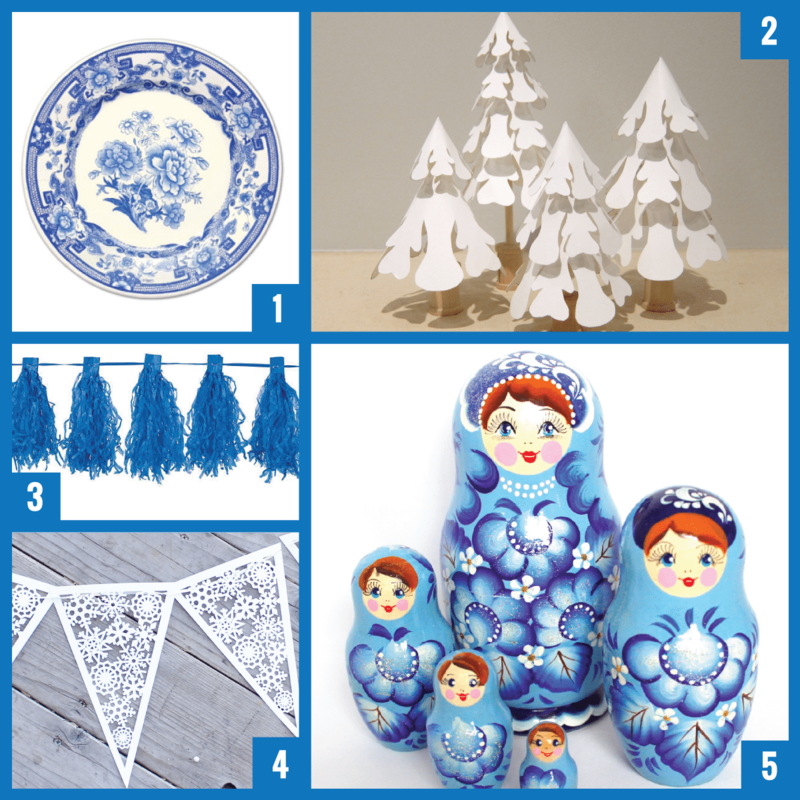 We have also put together some ideas for your Russian New Years party. 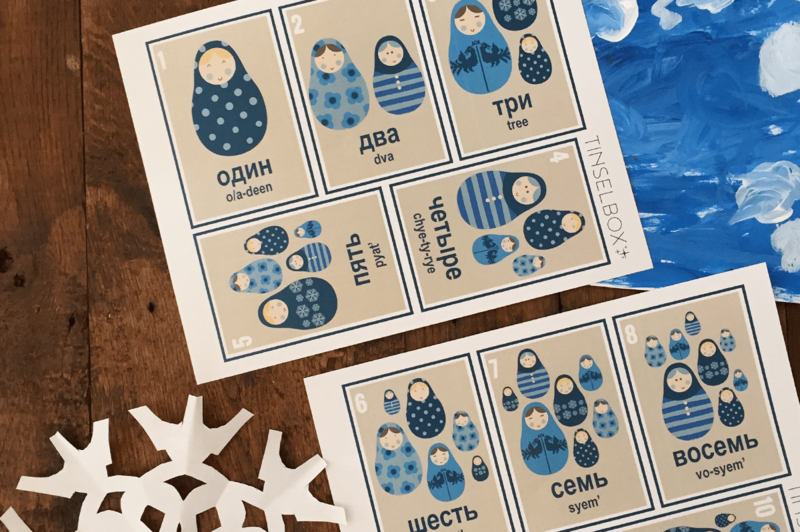 We were inspired by these cute Nesting Dolls and thought their Blue, White and Gold colors would be a great theme that would go well with the items in your New Year Tinselbox. 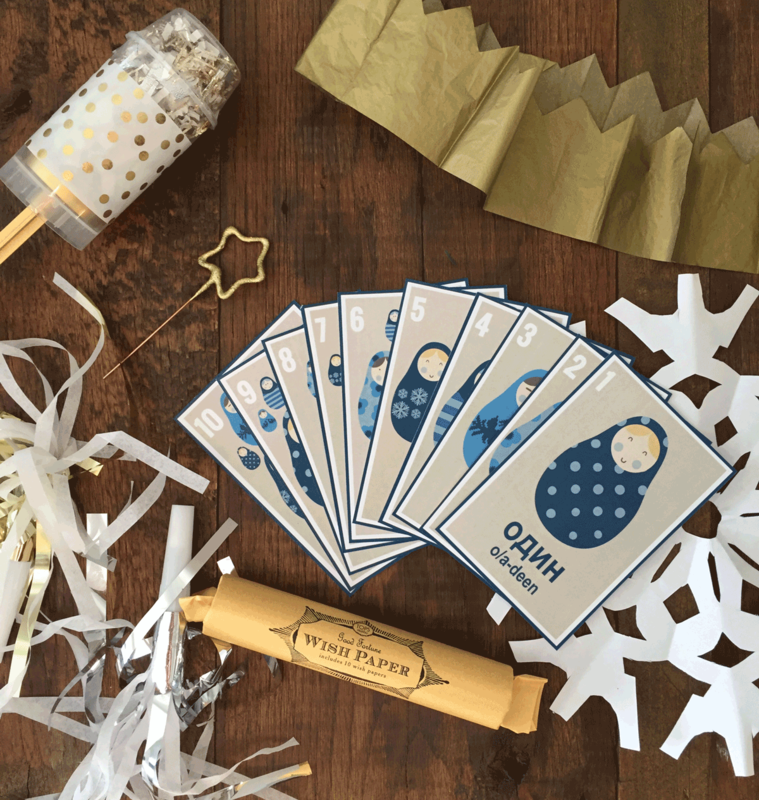 We have also put together a list of other coordinated and original items you could purchase to make your party a true blue Russian experience. Now that the décor is figured out, your food should also match the festivities. 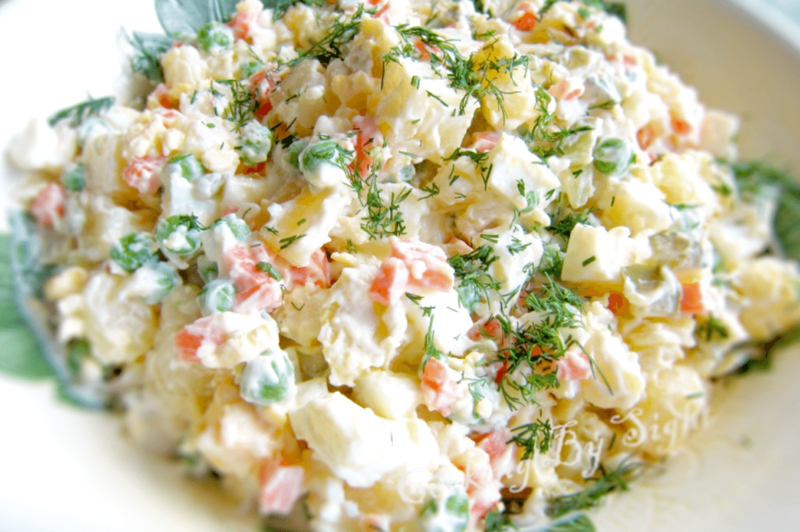 A Russian New Year’s isn’t complete without traditional Russian salads. The most popular is Olivier salad, which includes potatoes, carrots, pickles, green peas, eggs, chicken or bologna, and mayonnaise. Honest Cooking has a great recipe. But your party needs more than just a yummy salad and Bon Appetit magazine has a great article on food you could do – straight from Russia. And let’s not forget the adult beverages. 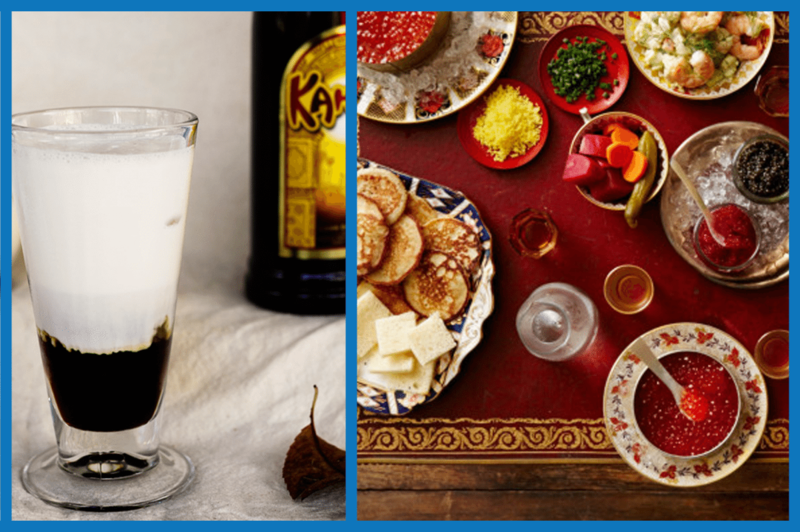 We love Foodie with Family’s White Russian Milkshake and think to goes well with the snowy theme Russian party. Russians welcome the New Year by saying “S Novim Godom!” (С Новым годом). But we didn’t think that just the décor and food were enough, and that we needed a fun activity to help ring in the new year. 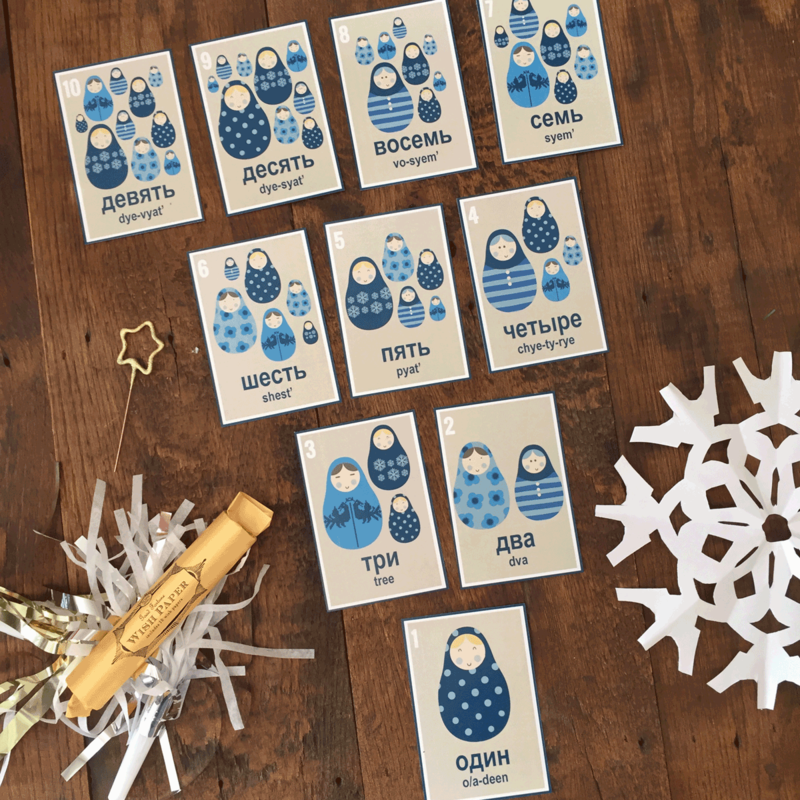 So we designed these cute downloadable and printable Russian nesting doll countdown cards. These will help you and your family and friends do the countdown in Russian. In fact, these would make a great party favor. Bundle them up for each guest.